I made two Little Pony themed cakes in June. And I am sharing with you today how I made my rainbow cake toppers. I love using modeling chocolate as my medium as it is less stretchy and dries so much faster (pop decorations in the freezer for a few minutes and they will dry almost instantly). 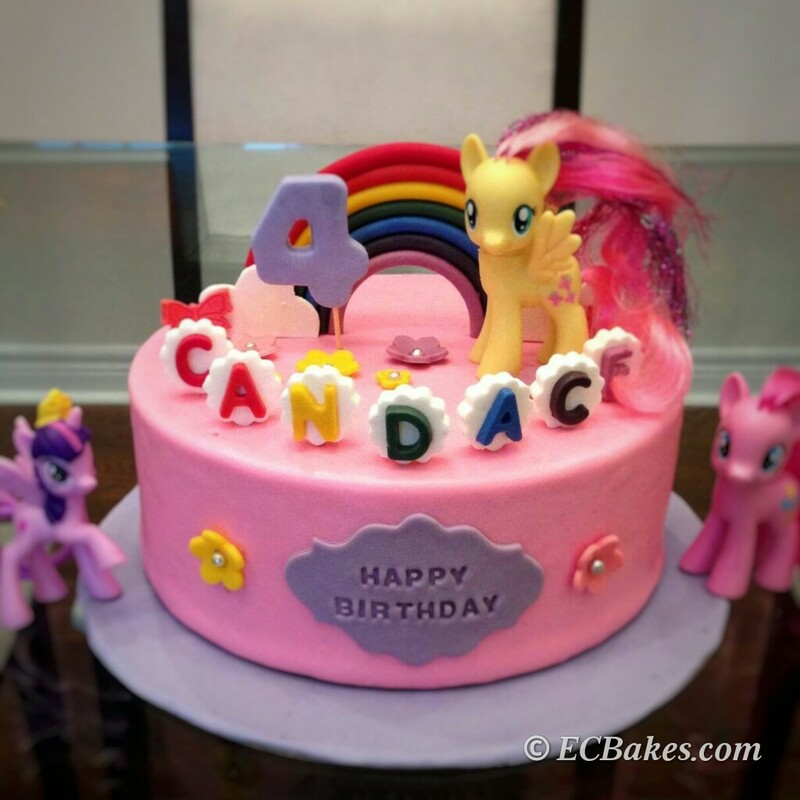 The topper can also be made with gumpaste or homemade fondant with tylose powder added. However, the drying time would probably be longer. First make your rainbow colors. With modeling chocolate of red, yellow and blue, create orange (red and yellow), green (yellow and blue), indigo (blue with a little bit of red), and purple (red and blue). Mix with white modeling chocolate if the shade is too dark. Roll each color into long ropes. You will need more for red, orange and yellow. Work on a piece of parchment paper so it’s easier to move the rainbow around. Pick something with a circular base as a guide or support. It could be a circle cookie cutter, a bottle cap or a cylindrical building block, depending on how big you want your rainbow to be. Wrap the purple rope around the top half of your guide. Place the indigo rope above the purple one and glue the two ropes together with edible glue. Continue with the rest of the colors. Remove the guide and chop off the bottom neatly with a sharp knife. Insert one to two toothpicks on each side of the base of the rainbow (I forgot to take pictures for that). For the clouds, roll white modeling chocolate into balls of different sizes. Attach balls to the base of the rainbow with edible glue. You may also cut out pieces of cloud-shaped modeling chocolate with a sharp paring knife and attach them to the rainbow base. Let dry completely in a cool place before placing onto cakes. This 6-inch, two-layer vanilla birthday cake was for my daughter. The other one was an 8-inch, three-layer chocolate and vanilla cake made with soy milk. It was for my friend’s daughter who was allergic to milk. This was a bigger rainbow so I used a bigger circle cookie cutter as the guide when I assembling my ropes.